Beginning in October 2007, the world has survived a Financial Crisis like no other in modern times. It is the first truly Global Financial Crisis ever experienced. This crisis brought to light a vast array of financial instruments (CDO’s, CDS’s, CLO’s, etc.) being offered by murky financial entities (SIV’s, VIE’s, SPE’s, QSPE’s etc.) that were completely unregulated, often offshore, always off balance sheet and never traded through any regulated exchange. None of these are regulated nor understood by sovereign governments. Minimally, this is a recipe for fraud. But definitely, it has been a modern day financial “wild west” for the innovative and aggressive! LEND: To pull the US and Global economies out of the abyss of the Financial Crisis the authorities have been forced to accept the implementation in the US of ZIRP (Zero Interest Rate Policy). A policy that has resulted in a Fed Funds LENDING Rates of 0.25% but 30 to 90 day Treasury Bills offered at absurd 3 – 7 basis points. With a +3.5% inflation rate [0.25 – 3.05] we have an unheard of -3.25% Real Rate. The tax payer is effectively paying the banks to borrow money. BEND: Since the banks aren’t willing to pour this money back into the US Economy and specifically into US expansion and consumer credit, the Federal Reserve has additionally implemented the central bankers “Nuclear Option” called QE (Quantitative Easing). 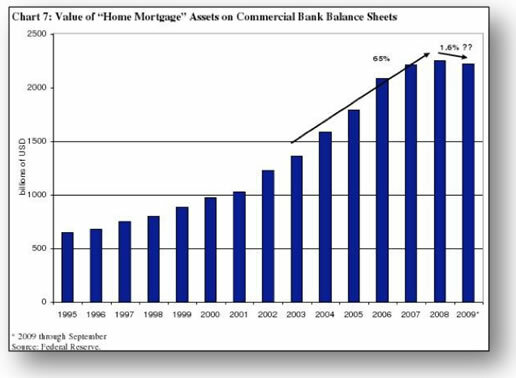 As such the Fed has purchased $1.4T in Agency Debt and Mortgaged Backed Securities (MBS) & $300B in US Treasuries. This has effectively disconnected the US Debt market yields from any source of reality. If this is not enough, we have implemented the greatest experiment in Monetary Policy in the history of the capitalist system with the implementation of: 1) TARP, 2) TALF 3) PDCF 4) TAF 5) TDWP 6) TSLF 7) CPFF 8) MMIF 9) AMLF and 10) Massive foreign currency SWAPS. All of these initiatives were aimed at BENDING a failed system back into operation through Government Guarantees that ‘temporarily’ removed inherent risk. It is to be seen just how temporary these programs will become. Remember, Income tax was originally implemented to solve the temporary funding crisis of WWI! These initiatives intentionally improve banking profits by an extraordinary degree and the banks will no doubt lobby to ensure some measure of the initiatives remains. SPEND: Further to the above Monetary Initiatives, we have implemented Fiscal SPENDING Policies based on 1930’s Keynesian Economic doctrine of Deficit Stimulus Spending as a framework in which to restore economic growth. This has resulted in a 2009 deficit of $1.4 Trillion and a 2010 deficit expected to be close to $1.8 Trillion. This will give the US a national debt of $14 Trillion, which will be larger than 12% of GDP, not including Federal Unfunded Liabilities of $62.5 Trillion, according to official government estimates. The G-20 in total have now authorized 2.2 Trillion in stimulus programs to restore growth. The Global economies together have Lent, Spent or Bent $27 Trillion in financial assets. Meanwhile total US workers unemployed continues to rise. All of the US $11 Trillion “Lend, Bend & Spend” Initiatives, on its $12 Trillion economy, could at best be described as “Triage” actions to stop the immediate hemorrhaging & stabilize the Financial System. The next stage has focused on the effective “Recovery”. 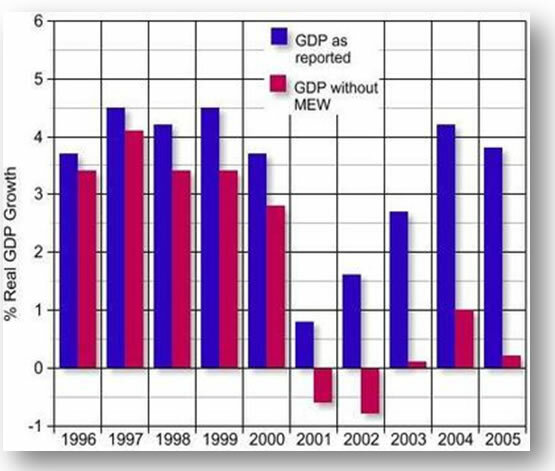 Despite the $787 Billion “American Recovery & Reinvestment Act”, ‘we have not achieved a real recovery. 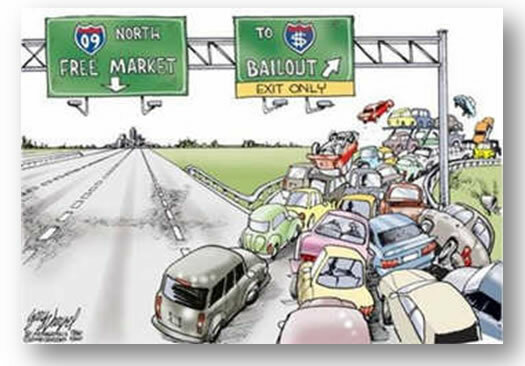 We have achieved an artificial perception of a recovery through policies that simply ‘kick the can down the road’! Since March 2009 we have witnessed an ‘Accounting Recovery’ driven by the implementation of the modern Behavioral Economics theory of MOPE (Management of Perspective Economics). The prime objective has been the recapitalization of the banks through asset appreciation and capital raising versus the unpopular nationalization alternative debated at the onset of the financial crisis. 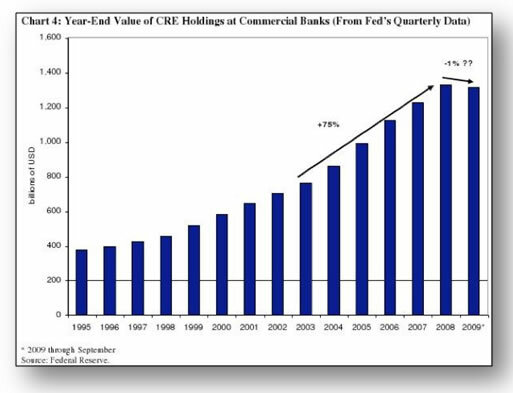 With an elevated stock market the Fed has been very clear to the banks that NOW is the time to increase capital. Consequentially in recent secondary offerings, Citigroup has raised $21.1B, Bank of America $12.2B and Wells Fargo $12.2B. Unfortunately we feel this is only a precursor to increasing centralized planning and an era of Big Government. In March 2009 the market bottomed and began a dramatic recovery. 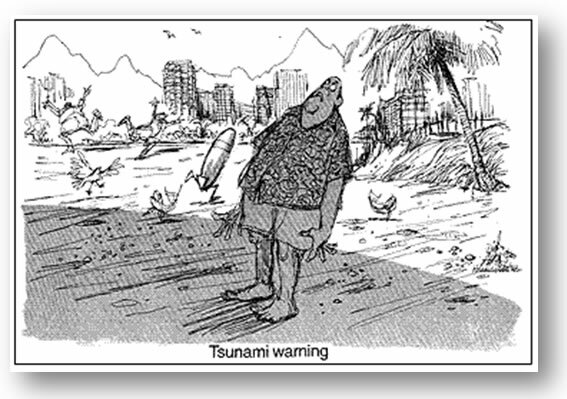 This occurred immediately with the reversal of FASB 157 in March 2009. Congress placed such pressures, including potential legislative measures, that it forced the Accounting Standards Boards to reverse the Level 1 Capital Ratio standards regarding the treatment of “Mark-to-Market” of the massive ‘toxic’ assets on the books of the banks. This change took insolvent banks and obscured problems by making them completely non-transparent to any analysis. The government ‘stress tests’, nor their economic assumptions, were subsequently ever made public. As Commercial Real Estate values plummeted and are now approaching 45 – 60% declines, the government in July changed the accounting regulations so banks and financial institutions would not have to reflect their true market value. This problem is so huge it makes the Sub-Prime Crisis look like child’s play but has been ‘removed’ through accounting treatment. This treatment was called ‘fraud’ before the changes and was a felony that involved prison time. This does not take away from the fact there is a $2.7 Trillion iceberg floating ‘dead ahead’! As the Housing foreclosures mounted the government additionally changed the accounting, in this case on how non-performing mortgages could be treated. As an example, many of the 8 Million homeowners who have completely stopped paying their mortgages are presently being left alone so that their mortgage loans can be accounted for at the original loan-value book value by the banks and other financial institutions. More accounting games! 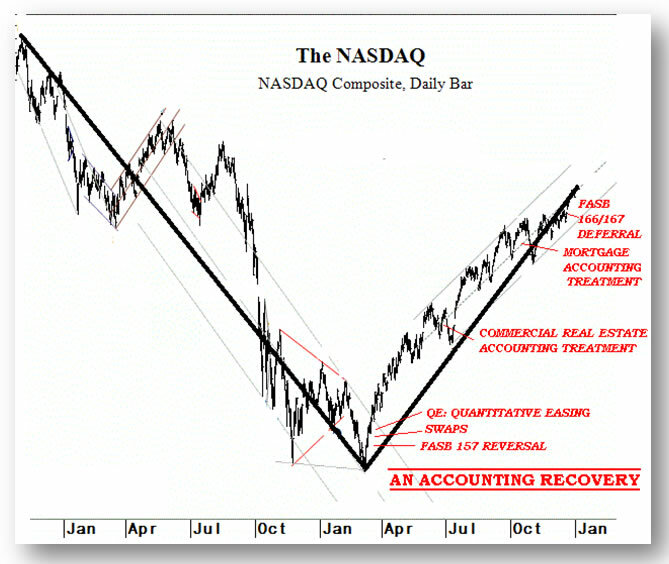 WHAT THIS MEANS: A ‘Back-of-the Envelope’ Analysis & Some Common Sense. 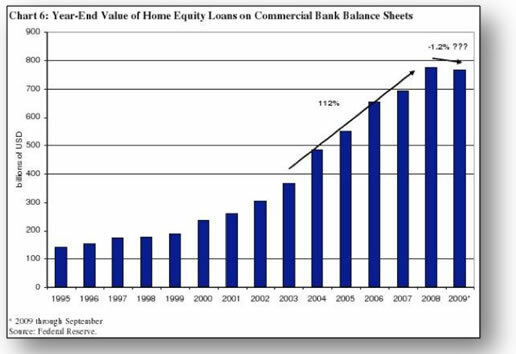 The banks have in addition to not yet accounting for Mortgage values in a realistic manner, have not prepared for the next major wave in mortgage resets & defaults! The Case-Shiller 20 City Composite indicates a -7.3% drop in national prices (1). Robert Shiller, co-founder of the composite, has indicated he would not be surprised to see another 5% to 10% drop in the spring (2). Is it any wonder he has this “suspicion” when you consider the chart to the right? THE REALITY: - 7.3% Composite 20 city Drop (1) & about to get much worse! 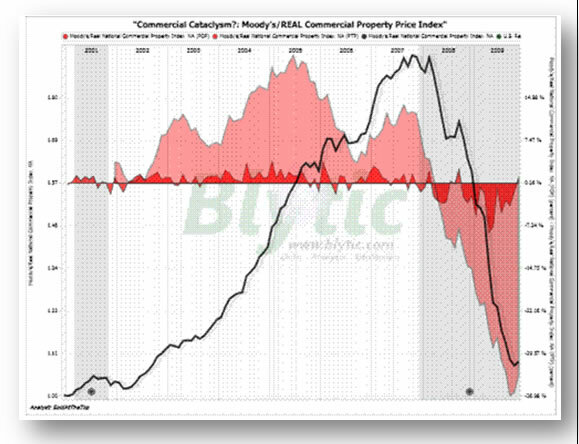 Does this look like a 1% drop in Commercial Real Estate Values to you? Home Equity Loans dominated loan growth for years. Do we really believe people are defaulting on their mortgages, going into foreclosure and yet paying their Home Equity Loan? Solid numbers that isolate the real levels versus bank reporting are difficult to find. Do we really believe it is only 4.3% ever mind the insignificant 1.2% the banks haven taken from an accounting stand point? For anyone buying Banking stocks or LONG the market ... Caveat Emptor! 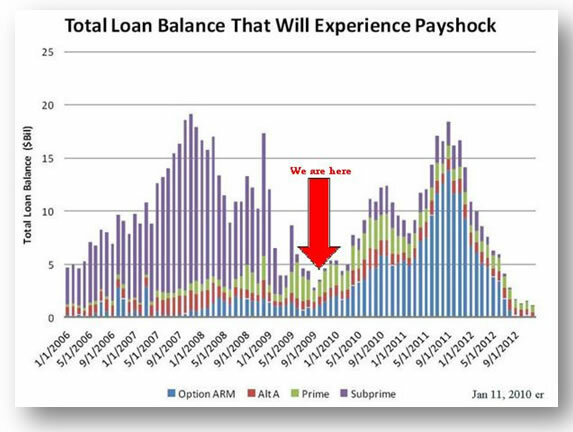 (4) 01-15-10 - What If Everyone Stops Paying Their Mortgage?